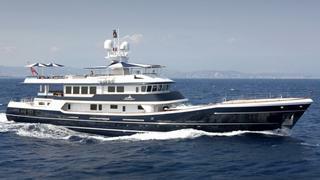 The recently purchased 49.95m expedition yacht Shandor, now renamed The Mercy Boys, remains for charter through Hill Robinson and is available from April 2013 in the West Mediterranean. The Mercy Boys was built by Schweers in 1986 and refitted in 1999 and 2008. Lloyds classed and MCA compliant, she has a classic John Munford interior and accommodates up to 12 guests in a master, two double and two twin cabins with two Pullman berths. This superyacht, the first true expedition yacht, offers the opportunity to explore the world in comfort and safety. She is one of the most seaworthy yachts of her size, is full of character and offers unparalleled deck and dining space – along with comfort and safety at sea. The Mercy Boys charters at weekly rates from €115,000 in high season and €99,000 in low season.